Many industrial processes require that, from time-to-time, air is diverted to a bypass stack rather than continue downstream to another part of the process. Flowrite Industrial Dampers Ltd manufactures a T-duct linked damper unit which performs this duty. As the name suggests this consists of a T-piece duct section with an inlet and two outlets, each of which houses a single-vane damper. An actuator is fitted to one of the damper spindles and the two spindles are mechanically linked by an external, adjustable linkage, such that as one damper opens, the other closes. As a result air is either directed downstream to the process or diverted to bypass. 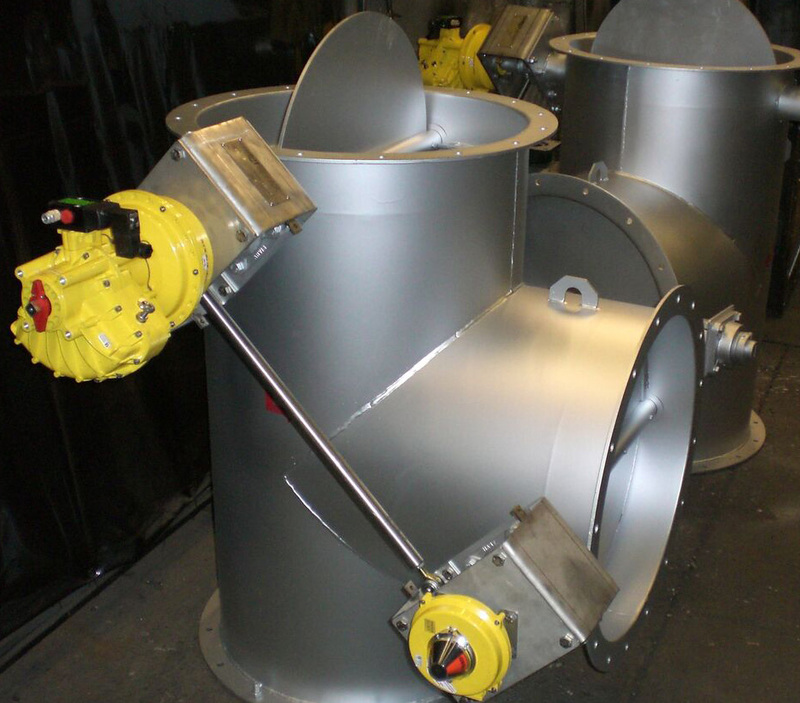 All types of actuation offered by Flowrite are available on T-duct linked dampers – pneumatic, electric, hydraulic or manual. Should there be a problem downstream, often a fail-safe facility is necessary in order to divert air to bypass. In this situation, pneumatic actuation is the recommended option as the form of actuation can be easily and cost-effectively fitted with a spring failsafe device. A failure position (usually to bypass) can be ensured on either loss of pneumatic air pressure, or on loss of the electrical control signal, to the pneumatic solenoid valve. Pneumatic or electric positioning actuators can also be used to proportion air flow between the two outlets. 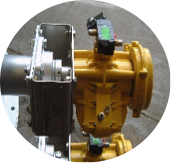 For more information on actuation types click here . As with all Flowrite dampers open and closed position switches can be fitted for position indication. These can be fitted to one or both dampers in a T-duct linked damper unit. Various seal options are available on a T-duct linked damper unit. It is often a requirement that one of the two outlets has a high sealing efficiency, whereas a good seal is not so important on the other outlet. Seal types can therefore be mixed – one type on the process outlet, another type on the bypass outlet. 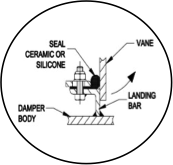 For more details on seal options click here .